Phenology defined as the ‘observation and investigation of the seasonal timing of life cycle events’ and how these are influenced by seasonal variations in climate, as well as other ecological factors (1). The word is derived from the Greek phainō, “to show, to bring to light, make to appear”2 + logos, amongst others “study, discourse, reasoning”(2) and indicates that phenology has been principally concerned with the dates of first occurrence of biological events in their annual cycle. Timing of bird migration, the dates of egg-laying of birds and amphibian, mammalian hibernation are examples from the animal world (3). Plants are the most common focus of phenological studies because of their fixed location and suitable for repeated seasonal observation. Timing of budbreak, leafing, flowering, fruiting and leaf coloring are the common growth stages defined as mainly “phenophases” (4). Phenophase is an observable stage or phase in the annual life cycle of a plant or animal that can be defined by a start and an end point. Longer records, at least 5 years, are needed to examine trends of the life cycle. Phenological observations are important in aerobiology. Pollen shedding usually occurs only at certain hours of the day, and depends on the weather conditions directly. Phenological studies are important to verify that the flowers are shedding pollen; to identify certain pollen types found in the aerofllora; to predict next pollination season duration and severity (5-10). Figure. 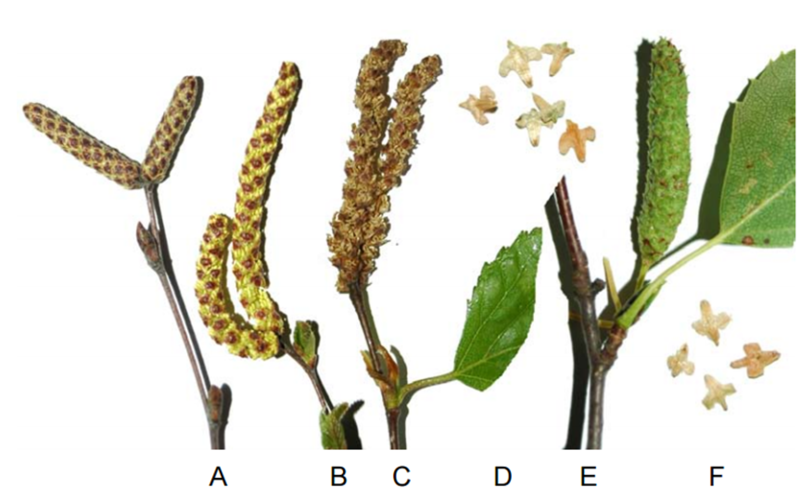 Various phases in the male flowering of birch, a female catkin, and shed seed. 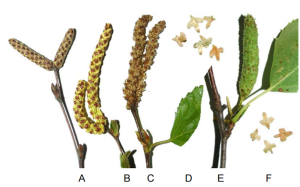 Male catkin before pollen release (A), during pollen release, (B) and after pollen release (C). A female catkin just before the shedding of seeds (E). Seed of Silver birch (D) and Downy birch (F). Photos: Eeva Kotilainen (4). 1. Rathcke, B. and Lacey, E. D. Phenological patterns of terrestrial plants. Annual Review of Ecology and systematic (1985)16: 179-214. 2. Liddell HR, Robert S. A Greek-English Lexicon, on Perseus. 3. Lechowicz, M.J. Phenology. In the Encyclopedia of Global Environmental Change, Volume 2. The Earth System: biological and ecological dimensions of global environmental change. (2001) Wiley, London. 4. Kubin, Eero. et al. Monitoring Instructions of the Finnish National Phenological Network. (2007). Finnish Forest Research Institute. 5. Aguilera F, Valenzuela LR, Study of the floral phenology of Olea europaea L. in Jaen province (SE Spain) and its relation with pollen emission. Aerobiologia (2009) 25:217–225. 6. Bonofiglio T,Orlandi F, Sgromo C, Romano B, Fornaciari M, Evidences of olive pollination date variations in relation to spring temperature trends. Aerobiologia (2009) 25:227–237. 7. 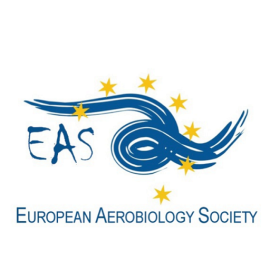 Cecchi L, D’Amato G, Ayres JG, Galan C, Forastiere F, Forsberg B, Gerritsen J, Nunes C, Behrendt H, Akdis C, Dahl R & Annesi-Maesano I, Projections of the effects of climate change on allergic asthma: the contribution of aerobiology. DOI:10.1111/j.1398-9995.2010.02423. 8. Estrella N & Menzel A & Krämer U & Behrendt H, Integration of flowering dates in phenology and pollen counts in aerobiology: analysis of their spatial and temporal coherence in Germany (1992–1999). Int J Biometeorol (2006) 51:49–59. 9. Fotiou C & Damialis A, Krigas N & HalleyJM & Vokou D, Parietaria judaica flowering phenology, pollen production, viability and atmospheric circulation, and expansive ability in the urban environment: impacts of environmental factors. Int J Biometeorol (2011) 55:35–50. 10. Frei T & Gassner E, Climate change and its impact on birch pollen quantities and the start of the pollen season an example from Switzerland for the period 1969–2006. Int J Biometeorol (2008) 52:667–674.